Technology and light. A better pair for a better future. 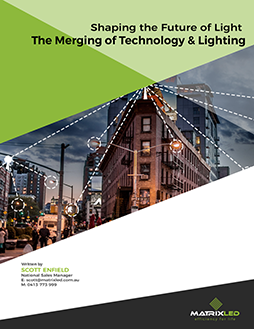 Download our whitepaper on smart lighting to see how LoRaWan is a game changer in shaping the future of light. Smart lighting solutions With the advancement of LED indoor lights, this method has been proven effective on saving and conserving energy costs. Finest control Communicating via wireless signals while using minimal power and maximum output, LoRaWAN technology can instantly give you a wider degree of control over fixtures such as LED indoor lighting. Flexible applications From shopping centres, streets, parks, offices and homes, MatrixLED compiles the best usage of this technology in order to better the environment that you live and work in.